What to do with Seeds? Easter is the festival commemorating the resurrection of Christ. It is the holiest of all Christian Holidays. Some Easter customs come from pre-Christian spring festivals. Others come from the Passover feast of the Jews, observed in memory of their deliverance from Egypt. The resurrection of Jesus took place during the Passover. Easter was celebrated on different days of the week, including Friday, Saturday, and Sunday. In A.D. 325, the Council of Nicaea was convened by emperor Constantine. They issued the Easter Rule which places Easter on the first Sunday after the first full moon on or after the vernal equinox (first day of Spring). 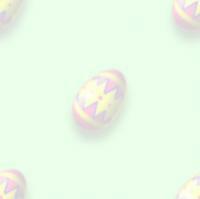 Therefore, Easter must be celebrated on a Sunday between the dates of March 22 and April 25. Good Friday denotes Jesus' crucifixion, and Easter Sunday denotes his resurrection. The true meaning of Easter is to celebrate the fact that 2,000 years ago Christ was crucified for our sins. Crucified so we can live eternally. He was laid to rest in a tomb, and after three days he was resurrected. He rose from the tomb to live forever with God. Preceding Easter Sunday is the 40-day penitential season of Lent, beginning on Ash Wednesday and concluding at midnight on Holy Saturday. Lent is a season of prayer, fasting, and almsgiving (acts of charity). Lent is observed in memory of Jesus' 40 day fast in the desert. Before 1966 heavy-duty fasting during lent was normal. - only one full meal a day. - two other meatless meals sufficient to maintain strength. No parties, showers, dances or other festive events. In recent years, Christian have strayed away from this strict fasting during Lent, and turned more to acts of charity. Lent is a realistic down-to-earth time. It's about ashes & the cross. It's about how we spend our time. It's about sin & sorrow, life & death. Lent may be hard at times, but it is meant to lift our inner spirit. It is meant for us to realize that we are made for the unimaginable greatness of God.